Cathy's Card Spot: Watercoloured cone flowers. 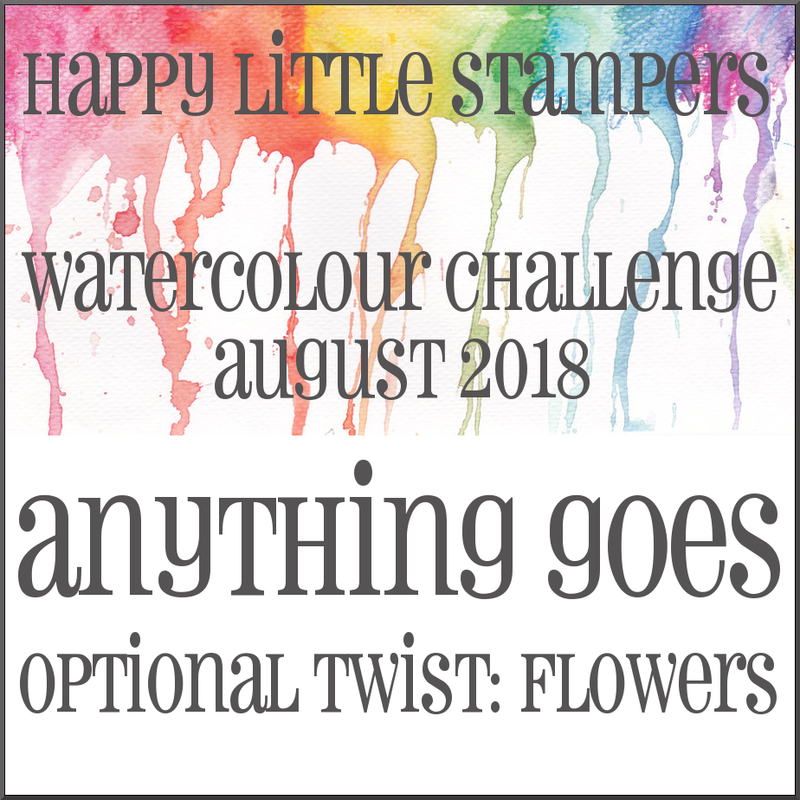 Hi everyone, I was delighted when Kylie asked me to play along as a guest designer at Happy Little Stampers after winning the June watercolour challenge. There are so many ways to play along whether it be paints, powders, or as in this case pencils. 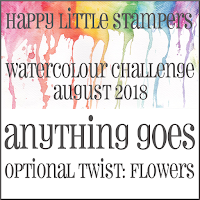 The theme for this month is anything goes watercolour with the option of flowers. I stamped these flowers in versafine smokey grey, fussy cut them, and coloured them with Inktense pencils and a water brush. The sentiment is from the HLS doodled flowers set. I love the fonts on these stamps, and they are a great size. Make My Monday where the theme is to colour your image. Simon Says Stamp Wednesday, where the theme is anything goes. Stamps: Stampers Anonymous Flower Garden; Happy Little Stampers Doodled Flowers. Dies: Crafts 4 U stitched rectangles. Other: Inktense pencils; watercolour paper; versafine ink smokey grey and onyxblack; clear ep; the flowers are layered onto a hammered card base. Ohhhh I love cone flowers and you have shown them beautifully here. A beautiful card and lovely watercolour flowers. This is such a classy CAS design Cathy and your flowers are gorgeous. It's so good to have you join us as guest designer this month. Beautiful creation! So glad you could guest design with us this month at HLS - your card is amazing - love the flowers, background, stitching and sentiment - they all work so perfectly together! 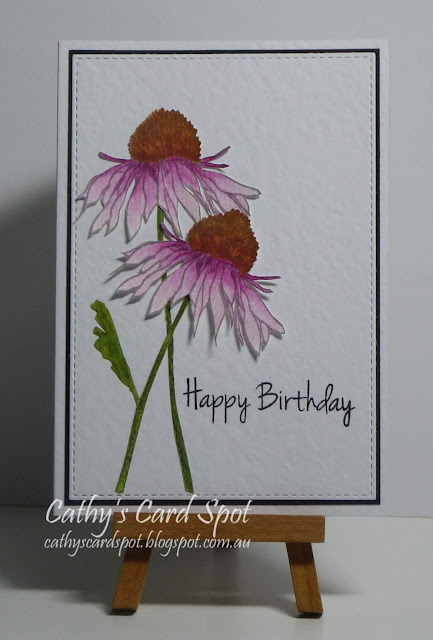 So happy to see you as our Guest this month Cathy and what an awesome coneflower coloured so beautifully. CASimply stunning! Stunning colouring, I love the design and the colours. Thanks for playing along at Make My Monday. Caz DT. Your flowers look amazing. I love how you guided the colors, becoming saturated with color. It looks stunning. Beautiful card, Cathy! I love those cone flowers and your colouring is beautiful. Congratulations on being Guest Designer this month, Cathy! Your card is stunning. Beautifully coloured and the perfect CAS layout! 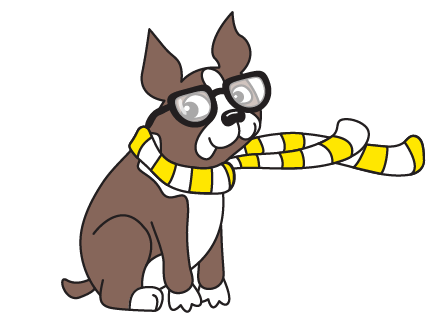 Cold snap - warm thoughts!